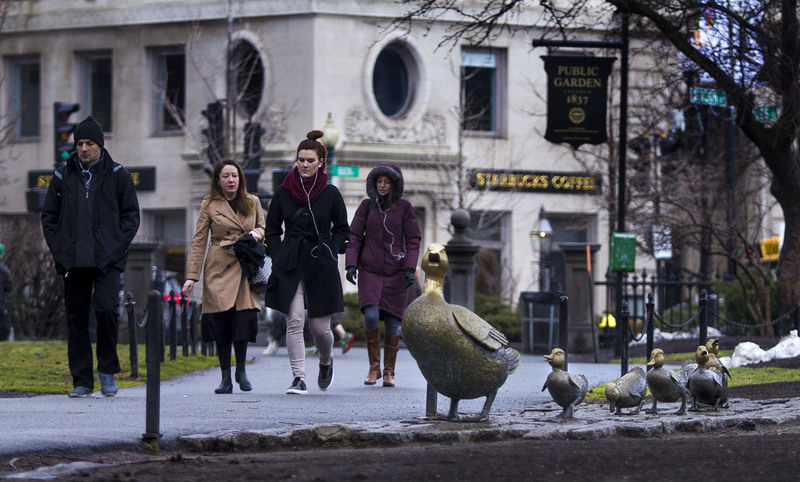 Nine bronze ducks call Boston's Public Garden home: Mrs. Mallard followed by Jack, Kack, Lack, Mack, Nack, Ouack, Pack and Quack. 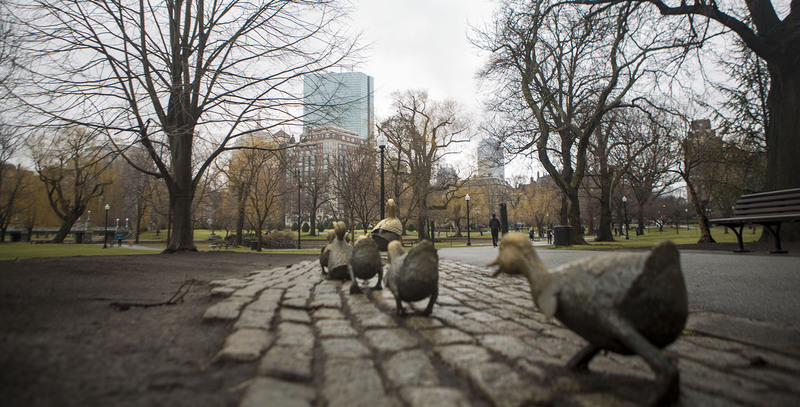 The ducks from Robert McCloskey's 1941 children's book "Make Way For Ducklings" have become a Boston icon since their installation 30 years ago. 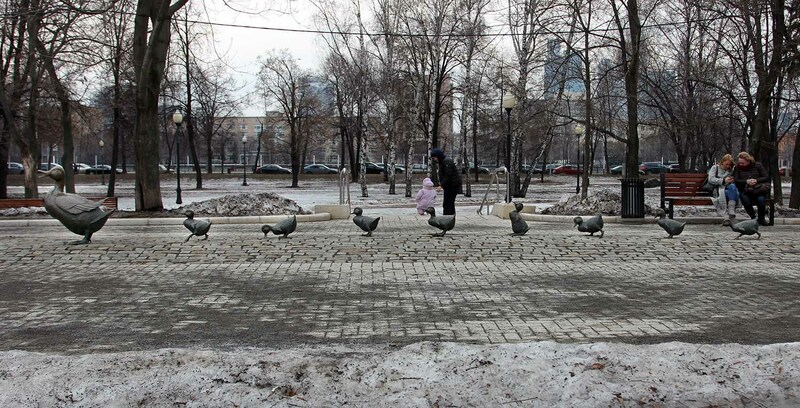 As it turns out, the ducklings call another city home as well — Moscow. 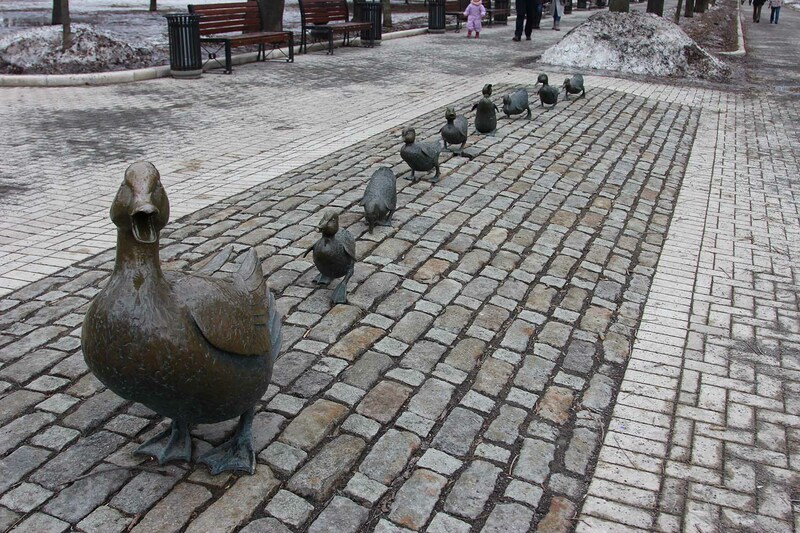 A copy of the "Make Way For Ducklings" sculpture was installed there in 1991. Then-First Lady Barbara Bush gave the sculpture to Raisa Gorbachev, Mikhail Gorbachev's wife. 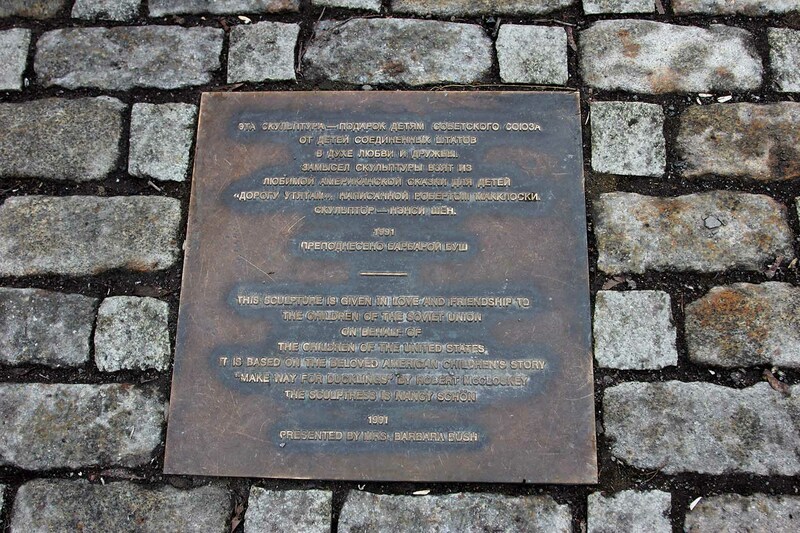 A plaque on the Russian ducklings sculpture — written in both English and Russian — says the sculpture was given "in love and friendship to the children of the Soviet Union on behalf of the children of the United States." The whole process actually started a year before in 1990. Bush was the commencement speaker for Wellesley College. Her guest was Raisa Gorbachev. 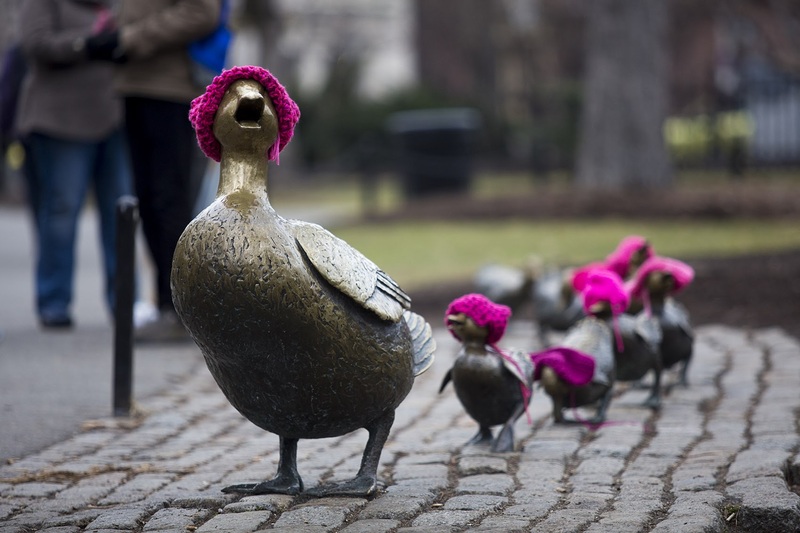 After the ceremony, the two traveled to the Boston Public Garden and visited the "Make Way For Ducklings" sculpture with a group of children. The story goes that Gorbachev admired the ducklings and things progressed from there. The public art offering came as the two countries signed a major nuclear arms treaty — the Strategic Arms Reduction Treaty. The START I treaty limited how many warheads and intercontinental ballistic missiles the U.S. and the USSR could have. Nick Burns, a Harvard University professor of diplomacy and international relations, traveled to Moscow for the treaty signing with President George H.W. Bush and Mikhail Gorbachev. At the time, Burns was the director for Soviet affairs on the White House National Security Council. Burns says while the Cold War wasn't as heated in 1991 as it once was, the treaty showed the Soviet Union and the U.S. were committed to peace. "Diplomacy is a combination," Burns says, "of hard power, of economics, of military issues, but you also want to be able to connect on a personal level." And the ducklings were one way to do that. "I had grown up just outside of Boston and of course knew about this story, had read it as a kid," Burns says. "It was surreal to see but we were very proud and I was, frankly, very proud to see that part of our culture in Boston had been exported as a symbol of peace to Moscow." 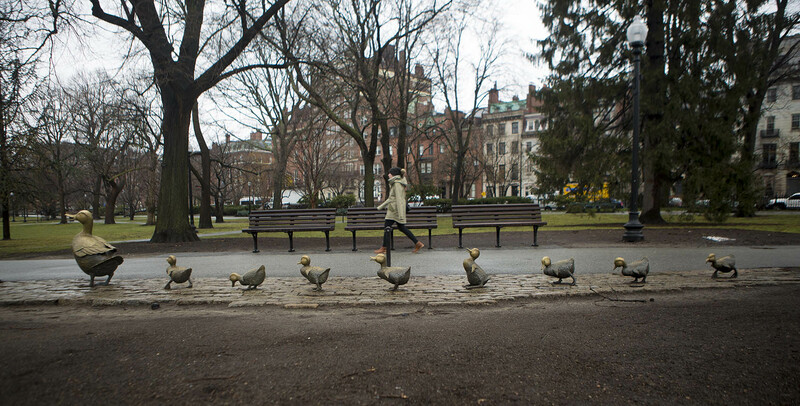 It was artist Nancy Schön who turned McCloskey's ducklings into bronze figures for the Public Garden in 1987. 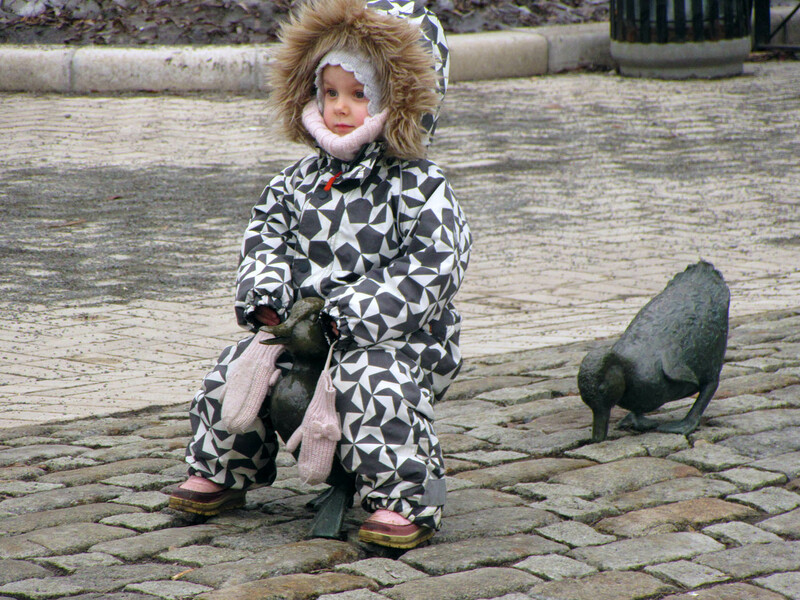 McCloskey didn't want the ducklings to appear in other cities, but made this one exception. "When I talked to Bob [McCloskey] about this, he said, 'I would be willing to do this if it's for children and it's not political.' So he agreed under these circumstances that it would be strictly for children and not commercial or political." Schön says Raisa Gorbachev and other officials surveyed eight different locations throughout Moscow to find the best site for the ducklings. They ended up picking Novodevichy Park — home to a 16th century convent (now a UNESCO World Heritage site) and a cemetery where Russian dignitaries like Nikita Khrushchev and Boris Yeltsin are buried. 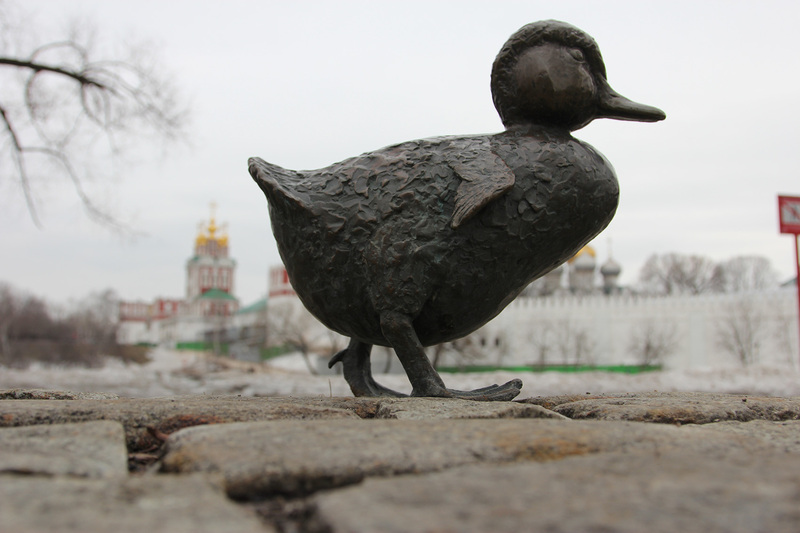 In July of 1991, Schön traveled to Moscow with a team — cobblestones and bronze ducklings in tow — to install the sculpture. Almost 26 years later, she remembers how emotional it was the first time she saw the location in Novodevichy Park. "It was so beautiful, I immediately broke into tears. Down below is the most beautiful little duck pond and the minarets from this convent, which are gold, were shimmering in this beautiful pond; and there were ducks there and there were little duck houses there for the ducks," Schön says. "So, I thought, 'Oh my gosh.' It was like a fairy tale." Schön worked to install the sculpture and then attended its dedication ceremony. Barbara Bush and Raisa Gorbachev were there, surrounded by a group of Russian children. The first democratically elected mayor of Moscow, Gavriil Popov, was also in attendance. Popov said that life in Moscow would improve with time and that, eventually, the ducklings would have lives as good as they had in Boston. "There was a feeling of optimism," Schön says. "The START treaty talks about getting rid of arms, that's what it's about. And these two governments were doing this together." Fast forward to 2017, Russians such as Tanya Malkova are still finding out about the ducklings. A life-long Moscow resident, Malkova never knew they existed until she was walking through the park on a recent February morning. She says she has been to Novodevichy Convent and the park before, just never to the side where the ducklings are. "I saw this group of metal birds which looked incredible," Malkova says. She says she now tells everyone she meets about the ducklings' history. For Malkova, the ducklings make her remember when the then-Soviet Union was starting to open up to the world — and Americans and Russians started to understand one another. "They bring me back to the time when the world was starting to change," Malkova says. "I believe that there is no way back to aggression and somehow it cannot be turned back. People are people everywhere. So, the ducks in Boston and the ducks in Russia — they're the same as people are the same everywhere." Back in Boston's Public Garden, locals like Rafi Finegold and his family found it hard to picture the ducklings outside Boston. "Those of us living in the Boston area, I think we think of this as like a piece of Boston history," Finegold says. Finegold says it's comforting to know Moscow residents (or Muscovites) and Bostonians have something in common given recent controversies between the U.S. and Russia. 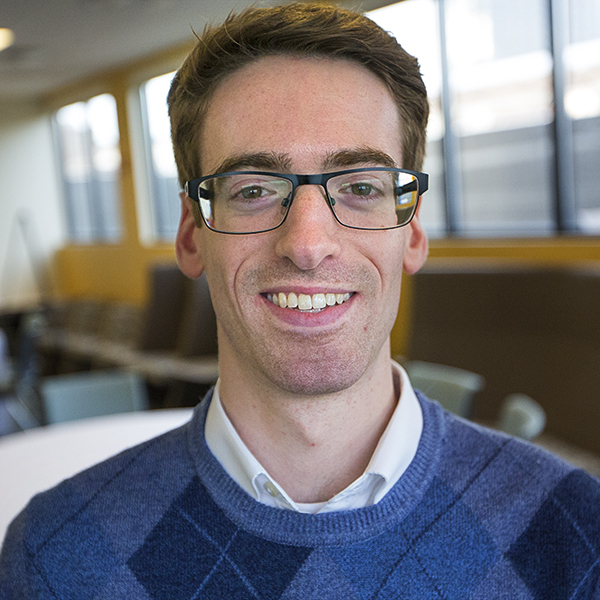 "Particularly at this time when you have like the leadership clashing, to have commonality at a human level seems like a good thing," Finegold says. Mrs. Mallard and her kids rose above the decades-long divisions between the United States and the Soviet Union. The threat of nuclear weapons, espionage and political calculations never stood a chance between them — not bad for a pack of ducks who just wanted to find the perfect home. This segment aired on March 31, 2017. Bob Shaffer is a producer in WBUR’s newscast unit.